Mr. Harkishin was born in Paris, France in 1965. His mother was Italian and his father was Indian. His acting career started in 1988 when he appeared in a childrens' TV series called Uncle Jack. He's been in several movies, most notably East is East and has been playing the part of Devendra Alahan since 1999. 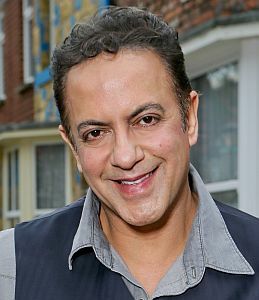 Dev Alahan, a businessman from Birmingham, arrived on Coronation Street in November of 1999 as the nephew of Ravi Desai who owned the corner shop and 6 other shops in the greater Manchester area. Ravi was moving to India and sold his 7 shop empire to Dev. Dev is a good looking man and is smooth with the ladies. This was evident when his ex-girlfriend Amy followed him to Weatherfield to try to get him back and when she was unsuccessful, pretended she was pregnant and pretended to have attempted suicide. Dev exposed her to the neighbours and was vindicated. Over the years, Dev has dated and nearly married barmaid Geena Gregory and solicitor Maya Sharma. He had several other short term flings including Tracy Barlow and an infamous one night stand with Deirdre who worked for him in the shop. He brought Sunita Parekh to the shop flat to help her as she was trying to avoid an arranged marraige. Sunita fell for Dev who didn't return the feelings for quite a long time but eventually he realized he loved her and they married. The hitch was that Maya, his ex, was loony and had set Sunita up to be arrested on her wedding day. Maya had married a half dozen or more immigrants under Sunita's name and she was held for immigration fraud. When Dev stood by her, Maya went mad and set fire to most of his shops, kidnapping both Dev and Sunita and nearly killing them in the flat after setting fire to the shop below them. They were rescued at the last minute by Charlie Stubbs and Ciaran McCarthy and Maya is probably still rotting in prison! Dev and Sunita's love was not to last. Just a few months before Sunita was due to give birth to twins, she discovered that Dev had fathered several daughters with as many as 3 different women that worked for him in his various shops. One was even old enough to have a child of her own. Sunita felt she could not trust Dev and they divorced. Dev floundered for five years, though did get to know the youngest of these children, Amber. He dated a mother and daughter, the daughter exposing him in more ways than one when she found out. He liked to golf and discovered that a friend at the golf club was engaged to his ex-wife, Sunita which brought her back into his life. He started spending more time with his twins and eventually won the heart of Sunita who moved back to Coronation Street with him though she insisted them buy Number 7 rather than live in the posh Victoria Street flat he now owned. Sunita nearly died in the tram crash but recovered. It turned out Dev didn't have insurance and they experienced some serious financial pressure where he ended up selling all his shops except the C.S. one and kept hold of the kebab shop that he'd recently bought as well. He is delighted that his son, Aadi, has a talent for golf. Later, though, the financial pressure made a shambles of his relationship with Sunita and she had an affair with sleazy Karl Munro. They split up but had almost reconciled when Sunita died in the fire that consumed the pub. Dev is trying to pick up the pieces of his life and move on for his childrens' sake and is about to go into business with a younger man named Kal and open up a gym on Victoria Street. See Diane's Web Page for more about what happened at this event. Click on the face to read about the event. Copyright 2015 DownEast Streeters Non-Profit Society. All Rights Reserved. ITV owns the rights to all Coronation Street characters, names and places.